Louisa: When did you first become vegetarian and was it something that always interested you? Michael: I became vegetarian decades ago. I can’t remember exactly when. It was a gradual process, starting with cutting out red meat, then poultry and fish, and now dairy. It’s been an ethical dilemma all of the way, as I knew at each stage that I should be further along the journey, but I felt that I was more likely to succeed by taking it in stages. I still have an ethical dilemma in that I have five rescue cats, who have a cat-flap so they can come and go as they please, but who are less than impressed if I don’t supplement their mostly Royal Canin Sensible-33 diet with some meat. Louisa: Did you have much support from others in your life? Michael: My late wife Anne Holliday was very supportive, though she was not vegetarian. We used to either make two separate meals, or sometimes share vegetarian meals. After Anne died four years ago, I had to adjust to living and dining alone after twenty five years together, and I have ended up cooking less often and eating out more. About a year ago, I became mostly vegan at home, with the exception of Quorn products which I had mistakenly assumed were vegan, and vegetarian when eating out or visiting friends. That was partly because I didn’t want to impose my ethics on everybody else, and partly because being vegan outside the house seemed to turn every meal into a United Nations negation process. Louisa: More recently, you transitioned to veganism, how has this been for you? Has it been harder or easier than you expected? Michael: Ashling O’Brien, the Dublin Chairperson of Atheist Ireland, became vegan a few months before I did, and in many ways Ashling was my inspiration for finally taking that step. It has been a lot easier than I expected. Since I have made the decision, I have found that I don’t miss eating dairy products. More than that, I don’t actually want to eat dairy products, so it is not really a struggle at all. 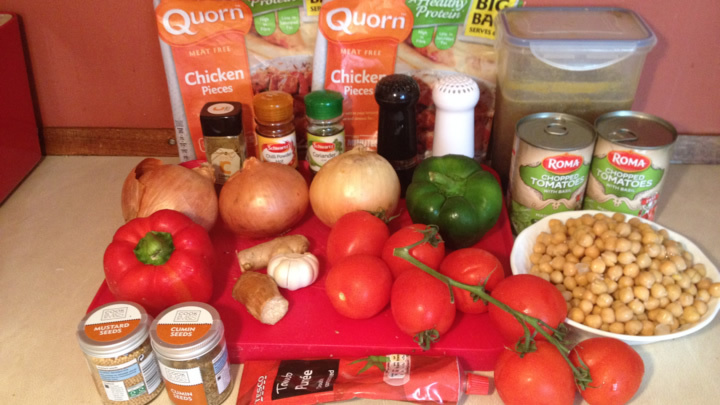 The one thing I do miss is Quorn products, because they had been the staple of my cooking recipes for years. Most Dublin restaurants still don’t have many vegan options. It seems to be like where they were for vegetarian options when I first went vegetarian. Cornucopia and the Cedar Tree are always good, but outside of that it can be touch and go. And eating out in other countries can be almost impossible, particularly France and Poland. Ashling and I have turned that problem into an adventure. What we do now, if there is no nice vegan option on the menu, is ask the waiter to ask the chef to make up something vegan of their choice. We find in most places that they see that as a challenge, and we usually end up with something really nice. Also, people constantly asking for vegan options is what will end up getting more vegan options on the menus over time. Louisa:What’s you current favourite vegan food? Michael: Chips. I didn’t say I was healthy! Also, anything flavoured with either lemon or mustard, vegan balti, vegan curry, the vegan parts of the vegetarian mezze board at the Cedar Tree, or whatever is on the menu at Cornucopia. Plus a side order of chips. Louisa: You are the founder of atheist Ireland; how does veganism or vegetarianism sit with in your moral and ethical stance? Michael: I think my vegetarianism is linked to my atheism, because as an atheist I don’t believe that the creator of the universe invented humans, and then gave us non-human animals for our benefit. I believe that we, along with non-human animals, are all worthy of respect as livings sentient beings that can experience pain and suffering and pleasure and wellbeing. I believe that non-human animals exhibit empathy, compassion, cooperation, reciprocity, fairness and justice to various degrees, because cooperation is as important to evolution as is competition. I believe that in future generations, we will look back at how we treat non-human animals in the way that we now look back on human slavery. Louisa: One last one! Do you have a favourite vegan recipe you would like to share with us? Michael: I have a Sedona dehydrator, a Hurom slow juicer, and a Blendtec blender, so many of my recipes are based around various combinations of using those. However, I’ve been mostly eating out for a while now, because my house is like a building site with renovations. When things get back to normal, I’ll get back to making dehydrated crackers with either blended banana and cinnamon and flax seed, or else blended tomato, onion, peppers, nuts and flax seed, then store them in the freezer for a constant supply of snacks. Other than that, my favourite recipes are quite basic. Chickpea curry is one of my staples. The pictures are from my pre-vegan days, so I now use mushrooms instead of Quorn. I generally make up the quantities as I go along, so it turns out differently each time. In one pan, cook mushrooms in oil. In another pan, cook onion, garlic, ginger, cumin seed and mustard seed in oil. Add cumin, coriander, chilli powder, salt and pepper. Add the cooked mushrooms from the other pan. 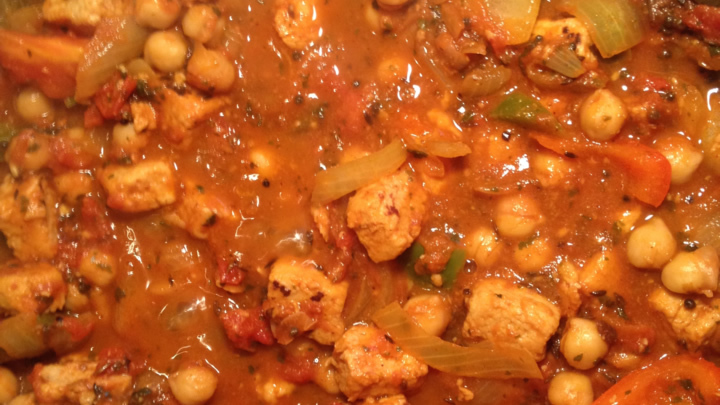 Mix in tomato puree, tomatoes, chickpeas, green and red peppers. Add vegetable stock, bring to boil, reduce heat and simmer.